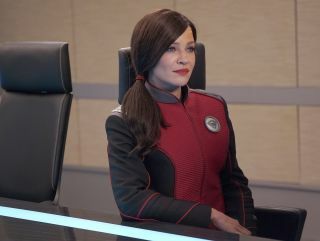 Lt. Talla Keyali, played by Jessica Szohr, is the latest addition to the crew of the Orville. She replaces another Xelayan, Lt. Alara Kitan (Halston Sage). The first thing to note about the latest "The Orville" episode, "All the World Is Birthday Cake," is that we're finally introduced to Lt. Alara Kitan's replacement. Since Halston Sage left the series in the episode "Home" (S02, E03) for reasons unknown, we've been waiting to meet the character set to be played by Jessica Szohr. Fox had been promoting her name since the beginning of Season 2. So, welcome, Lt. Talla Keyali. The fifth episode of the second season starts with an alien race, who have a level of technological advancement comparable to our own, deciding that the time is right to send a message into deep space announcing their existence. With great excitement, scientists, technicians and officials from the alien world gather as their giant transmitter array is aligned and prepared. "Alignment complete. Transmitters at full power. Now, all we need is something to say," says a technician. "Let's keep it simple. How about, 'Is there anyone out there?'" replies the leader. And so it is sent. You'd think they would have spent more time debating this incredibly important issue, but no. It's pretty much decided there and then. The Orville detects this message, and so a "first contact" mission begins. It's interesting that MacFarlane has chosen this to be the Planetary Union's standard for initiating first contact, unlike in "Star Trek," where a civilization must have developed warp drive capability. That standard forms what we know as the "Prime Directive" or "General Order 1." Under the Planetary Union policy, providing that an advanced alien race could actually distinguish between a deliberate message and the millions and millions of radio and TV broadcasts we send out, the human race could've been contacted as far back as the '60s. That's when the first interstellar radio message went out. Otherwise, it might have been the 1930s, when the first television transmission with any significant power was sent into space. This actually forms a key part of the plot of the movie "Contact," which was based on the 1985 novel of the same by Carl Sagan. The crew of the Orville arrive on the planet, called Regal 2, and are greeted by the leader, known as Prefect (John Rubinstein) and other top officials, all wearing outfits that look like they were designed by Hugo Boss around the 1930s. The crew are shown around various installations in the capital city, and Dr. Finn (Penny Johnson Jerald) notices that a great many healthy babies are being delivered prematurely by cesarean section, days and weeks before their due dates. Needless to say, suspicions arise that not all is as it seems. During a ceremonial dinner, which loosely resembles a similar scene in the excellent "Stargate SG-1" episode "The Other Side" (S04, E02), Cmdr. Kelly Grayson (Adrianne Palicki) casually mentions that it's her birthday and that of Lt. Cmdr Bortus (Peter Macon) in a few days. At this point, the officials from Regal 2 go nuts and arrest them both, calling them "jilliaks." Regal people take DNA samples from the rest of the away team to confirm their dates of birth, and the crewmembers are released and told never to come back. As for Grayson and Bortus, they face life imprisonment. Unsure how to handle this bizarre turn of events, Mercer contacts Union command and is explicitly instructed by Adm. Perry — played by Ted Danson in a quirky cameo — to not attempt a rescue. Music often plays a big part in "The Orville," which we saw last week with an obvious nod to John Williams and the music of "Raiders of the Lost Ark." This week the show makes more than a passing reference to the music of the late and great James Horner, who scored "Star Trek II: The Wrath of Khan" and "Aliens," among many other epic movies. Meanwhile, in prison, Grayson and Bortus can see that the other inmates aren't violent or unruly and that they're simply being punished for being born at the wrong time. We also see a pregnant female prisoner forced to give birth there and then. Quite why anyone would procreate inside a prison knowing full well the outcome is not adequately explained. Alien scientists, technicians and officials gather with great excitement as the first interstellar radio message is sent from the planet Regal 2. Episode director Robert Duncan McNeill, formerly of "Star Trek: Voyager" stretches out this scene for an unnecessarily long time. Perhaps we're building up to Grayson wanting a child herself later in the series. Grayson and Bortus take out some of the guards and attempt to escape. (It's fortunate they know how to use a P90.) However, the escape attempt is short-lived, and they're taken away to be executed. By scanning historical documents, the crew are able to determine that the disappearance of a particularly bright star above Regal 2 some 3,000 years ago (it collapsed into a singularity) may have been the foundation for the civilization's superstitions. They hatch harebrained scheme to launch a permanent solar sail and, in essence, re-create the star in the night sky. There are so many things wrong with the way this is handled it really makes the episode feel rushed toward the end. Perhaps the birth scene could've been shorter and more time could've gone toward sorting out this plot point instead. This causes something of a commotion in the upper echelons of government, and a reprieve is issued, even if we don't actually see it. Finally, back on the bridge of the Orville and a few weeks late, Grayson and Bortus finally get to have their birthday party. This week's episode seems to further fuel the notion that "The Orville" doesn't know what it is. We've seen an array of different styles and tones, from excellent original episodes like "Ja'loja" (S02, E01) to episodes that are love letters to sci-fi pop culture like "If the Stars Should Appear" (S01, Ep04) to last week's just-plain parody of "Star Trek: Discovery." On the upside, Talla fits in nicely with the crew. If Alara was from the Beverly Hills of Xelaya, Talla is from the Bronx. She's a little bit older, too, which hopefully means we'll have fewer whiny inexperienced-officer stories. We haven't seen or heard much from Isaac so far this season, but the scuttlebutt is that next week he plays a much bigger part and we see him remove his helmet, for some reason. Season 2 of "The Orville" is on Thursday nights at 9 p.m. EST on Fox in the U.S. It can be watched on demand on FoxNow and Hulu. It's also available on Fox.com in the U.S. In the U.K., it's on Thursday nights at 9 p.m. GMT on Fox. The first season of "The Orville" is available to buy on DVD, and a season pass can also be purchased from Amazon.